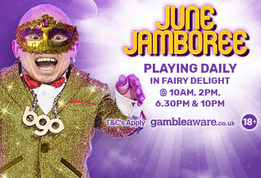 £500 June Jamboree | Play to Win prizes at BGO Bingo! Lord Bingo News Bingo Promotions Join the £500 June Jamboree at BGO Bingo! Join the £500 June Jamboree at BGO Bingo! This month, BGO Bingo has some really exciting events that you don’t want to miss! Head to the Fairy Delight bingo room for 4 special games that play daily at 10am, 2pm, 6:30pm, and 10pm. Full House winners in these games will get an exclusive invitation with 6 tickets to the £500 Jamboree game that’s happening on June 30th at 8pm! Tickets cost only 5p and you can get up to 120 tickets to maximize your chances of winning. This special game has a £500 prize with 1L sharing £50 and 2L sharing another £50. Join the June Jamboree at BGO Bingo for loads of jackpot fun! As soon as all 3 challenges are completed, an email invitation will be sent to 3 special games in Fairy Delight. These Big Competition games play at 7:30pm, 8:30pm & 9:30pm and have jackpot cash and voucher prizes too! Goodies up for grabs include £100 Amazon vouchers, £50 M&S vouchers, and £25 Argos Vouchers! So make sure you head on over to BGO Bingo and claim some of these amazing bingo treats!